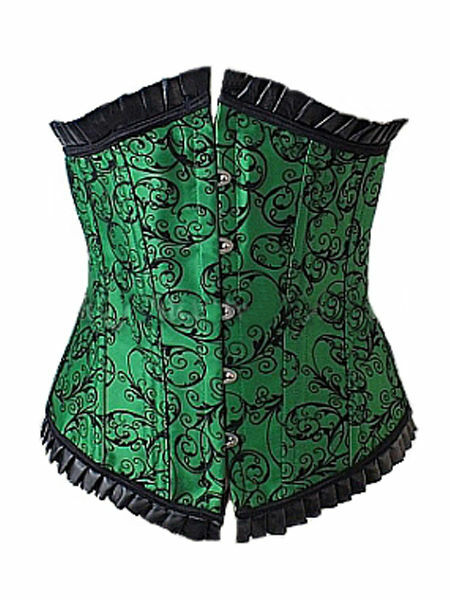 A green satin longer length underbust corset with a black flocked velvet swirly design and finished top and bottom with unusual black leather-look pleated trim. 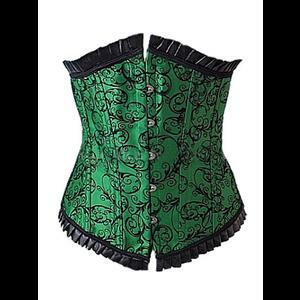 The corset has a front bust fastening with flat steel bones on either side and a further 6 acrylic double-channelled bones at the front and sides and 8 bones at the back. 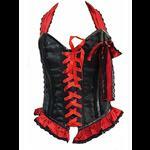 The back has metal eyelet and adjustable black satin corset lacing with a modesty panel. Looks stunning when worn with a black skirt and top and makes a change from the usual red and purple gothic accent colours. Underbust: 26" Waist: 24" Length at side: 12"
Underbust: 28" Waist: 26" Length at side: 12"
Underbust: 30" Waist: 28" Length at side: 12"
Underbust: 32" Waist: 30" Length at side: 12"